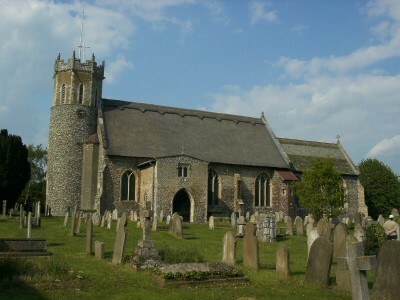 On 6 June 2014, the Norwich Citadel Band (Bandmaster Richard Woodrow) visited St. Edmunds Church in Acle, Norfolk. This is believed to be the first such occasion for the band, which was delighted to find a full church with an enthusiastic congregation warming to the sound of a brass band playing in the medieval building with its thatched roof. Items played by the band included Wonderful Day (Steven Ponsford), David of the White Rock (arr. John Gibson), Fanfare, Hymn and Thanksgiving (Dudley Bright) and Lift Up Your Voice (Stephen Bulla). A major work, Faith Reborn (Leslie Condon), told the moving but harrowing story of the Seoul Boy’s Home Band, whose members were marched off by North Korean soldiers and were never seen again. Further items from the band included The Children’s Song (Robert Schramm), Chanson de Matin (Elgar, trans. Wesley Kendrick), Yesterday (arr. Alwyn Green), Disney on Parade (Denny), Love Changes Everything (arr. Stephen Bulla), Sunset over the River Exe (Kenneth Downie) and Temple 125 (Kevin Larsson). Beneficiaries for the concert were East Anglian Air Ambulance, Mother’s Union and the Salvation Army. This article was posted in News and tagged Acle, benefit, concert, Norfolk, Norwich Citadel Band, St Edmunds Church on 19 September 2014 .